This image released by Warner Bros. Pictures shows Bradley Cooper, left, and Lady Gaga in a scene from A Star is Born. A Star is Born has been nominated for awards by every major Hollywood guild – producers, directors, actors, writers, cinematographers and art directors – which bodes well for Oscar. It won a Golden Globe, and has been nominated for seven BAFTAs and four Grammys. The National Board of Review, the Broadcast Film Critics, the American Film Institute, the Gay and Lesbian Entertainment Critics Association, the Alliance of Women Film Journalists, the African-American Film Critics and critics’ groups from Seattle to St. Louis, Iowa to Atlanta, and Dublin to Venice have showered it with love. 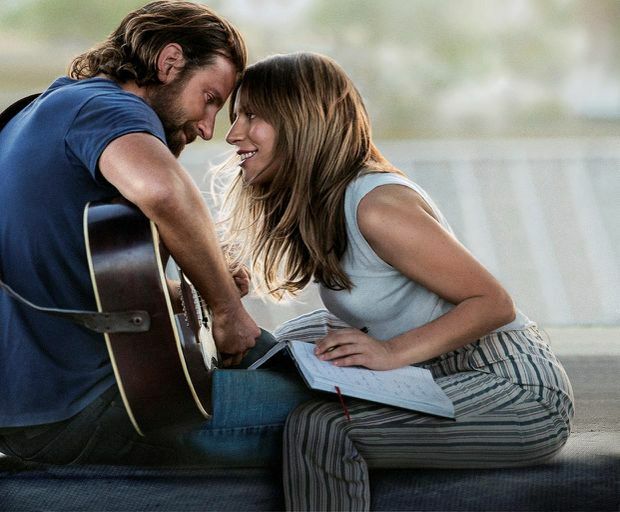 It’s still playing in theatres 14 weeks after its Oct. 5 release; it’s earned US$400-million worldwide; and the video for its ubiquitous song, Shallow, has 206 million hits on YouTube. And why? Because he looks at her. He, Jackson Maine (Bradley Cooper), looks at her, Ally (Lady Gaga). A lot. He looks at her when she sings. He looks at her when she’s looking at him. He looks at her when she’s not looking at him. He looks at her with curiosity, he looks at her with wonder, with lust, tenderness, drunken confusion, sorrow, shame. He looks at her whole face. He looks into her eyes. He touches his forehead to her forehead (frequently) and looks into her soul. Think I’m exaggerating? I made a list. Jackson first sees Ally at the eight-minute mark, as she sings La Vie en Rose in a drag bar. At 8:48, the camera pushes in on him seeing her. At 10:20, she lies on the bar; we see on his face the first strike of love, like an arrow to the chest. By 10:37, he’s wiping away tears. After her song ends, at 13:00, he peels off one of her fake eyebrows: “The whole point is I can see your face,” he says. At 17:00, he touches her nose – while gazing at her. At 21:00, he licks her finger to remove her ring – still gazing at her. At Minute 24, she sings to him in the light of the all-night market; at Minute 25, we see on his face the second strike of love, like a kick in the gut. At 27:00, we get this now-iconic scene (lifted beat for beat from the 1976 Streisand version, but it still works): Ally exits car. Jackson rolls down window, calls her name. She turns. “I just wanted to take another look at you,” he says. And then at 41:00, when they’re singing Shallow on stage in a massive arena, we get this progression: He stands back, looking at her while she sings. Next, they sing at two different mics, looking at each other. Then they sing into the same mic. As the audience explodes in applause, they kiss. And then he stops kissing her, to look at her. Looking has always been the backbone of romantic drama. It’s what the close-up was invented for. Rick looks at Ilsa while she listens to Sam play piano. Rhett looks at Scarlett as she cleans her plate. Katie looks at Hubbell while he sleeps, sitting up on a bar stool. Almasy looks at Katharine as she tells a story by firelight, and Hana looks at Kip as he takes down his hair. I’m not talking about the male gaze, where a woman is pinned down by the look; I’m talking about a woman or man being seen for their essence, for who they are. Ask any person what they most want in a partner, and eventually you’ll get to this: I want them to see me. Wanting to be seen is the bedrock of Instagram and Facebook, reality TV and personal YouTube channels. Wanting to be seen with love, to be marvelled at, drunk in – that’s the basis of every romance, real or on screen. That’s why the close-up is so powerful. We gaze into the eyes, for anything longer than a second, of very few people in our lives: our lovers and our children, that’s about it. Remember Mandy Len Catron’s New York Times quiz that went viral in January, 2015? It posited that any two people could fall in love by asking each other 36 increasingly personal questions – and then staring into each other’s eyes for four minutes. The questions make people vulnerable, which fosters closeness. But it’s the four-minute eyelock that seals the deal. We fall in love with our movie idols precisely because we get to linger over their faces. Watching two people do this together, whether it’s a big-screen drama or a Lifetime Christmas movie, has the same effect. A Star is Born came along at exactly the right moment, when the big screen was a parched desert in terms of love stories. The top-grossing movies of 2018 were comic-book films and adventure sequels. Only four movies in the top 50 even hinted at romance. ASIB was No. 12. Crazy Rich Asians was No. 16, and the other two were the Mamma Mia! sequel (No. 25) and Fifty Shades Freed (No. 33). In fact, the Fifty Shades franchise and The Great Gatsby are the only hit romances of this decade. For a real lovers-looking-at-each-other fix, you have to go back to the 1990s, to Ghost and Titanic and Jerry Maguire. A Star is Born handed us exactly what we were hungry for, when we’d almost forgotten we were hungry. Add to this the fact that Jackson is undeniably physically lovely, and Ally feels like she’s not. She, an ordinary person, has been noticed by him, a candidate for Olympus. It’s what ASIB’s other now-classic reference is all about: If there are 100 people in a room, and one sees you, and that one is Bradley Cooper … well, hey, you must be okay. Moreover, Ally knows what it’s like to be so full of yearning that you might die from it, while Jackson has been successful so long, he’s forgotten how to yearn. She reminds him how – and that yearning is an underrated component of love. That latter song is called, I’ll Always Remember Us This Way, and that is another crucial component to the film’s success. Ask any fan what they love about it, and most will say, “The first hour.” The falling in love, the hope. That’s not surprising – no romantic drama ends happily. Katie and Hubbell split. Katharine and Almasy die. Scarlett vows to go after Rhett, but we don’t see it. Because if we did, we’d have to face hard truths: People get used to each other. Their beauty fades, their love pales. Real life rises up. Married people, do me a favour: Think of how often you looked into each other’s eyes at the beginning of your relationship. Think of how often you do so now. In the movie, Jackson romps with a dog. The movie always stops before Ally gets irked with him for not cleaning up after it. So of course people love the first hour best. In the second hour, he stops looking at her.